All through the night the wind was blowing hard and we could suddenly see why the dunes had built up in this spot. The canvas sides of our pop top were flapping away, but not enough to make us worry about damage. 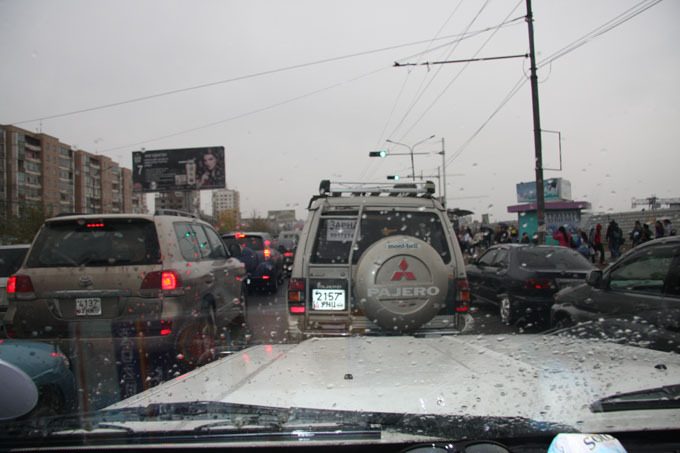 In the morning we headed on to UB with the roads getting better all the time. You still have to be aware of sudden and large potholes in the road. If you watch out for skid marks it gives you a bit of a warning! The traffic was heavy and it took us two hours to get from the west of the city to the east. We arrived in the Oasis Guest House later in the afternoon. They were happy for us to park in their carpark to sleep but with the use of showers, cafe and nice warm common area with wifi access. It is getting cold now with a biting wind. Weather is definitely on the change. In that way we may as well be in the city as out in the wilds. We made contact with ARB in an attempt to solve a problem with our diff lockers. Kea and ARB in Sydney have been very helpful getting us in touch with ARB Mongolia. We will be dropping in to see them while in UB. Evening spent in the warm ….